Meet people who love the sport of Inline Skating (roller blading). A group of rollerblading enthusiasts will meet at a location and go rollerblading for 2 hours or whatever time frame the group decides upon. This is a great social event for staying fit and getting hands-on tips. Thank-you all for joining the social skate! 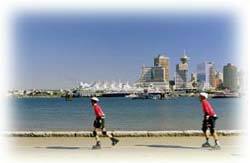 You could not have asked for more beautiful Vancouver sunny weather and a great work-out!! Yes, weather looks good. See you there! What are you waiting for? Get on the email list for the next social skate! Inline Skate from Science World to 2nd Beach, Stanley Park. Helmets are mandatory. Yes, that's right, no helmet and you cannot join this event. Sorry! Helmets can be rented for about two dollars. Also, you must be at least 19 years old! Wrist guards, knee pads and elbow pads are optional but recommended. You should highly consider wearing wrist guards in addition to a helmet. 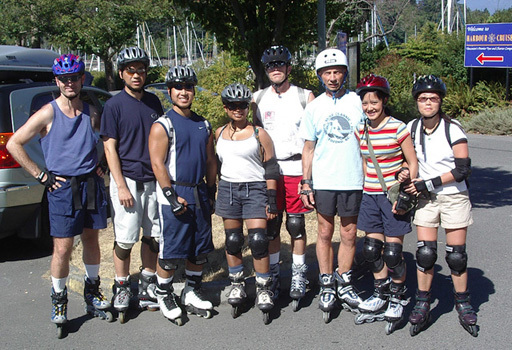 If you are not an advanced inline skater, it is a good idea to have all your protective gear. Trust me, road rash and sprained wrists is not my idea of Fun. Get ready to mingle, meet some new friends and share some rollerblading tips. Space is limited. To gain entry, RSVP via email or phone 604-603-5126 to secure your space. Cost is only two dollars IF you pay in advance, otherwise the price is $5 at the day of the event. Bring a friend and you get in FREE or each pays half). Don't forget to bring your own equipment, water bottle, sunglasses and sunscreen! 1) Inline Skate around Stanley Park. Meet at Stanley Park Parking Lot. - 500 Denman Street, Vancouver, BC. Get ready for a social skate around Stanley Park. We'll meet at the Stanley Park Parking Lot, one block north of West Georgia Street. Simply drive down Denman Street towards the water, go past W. Georgia Street and turn left into the parking lot. 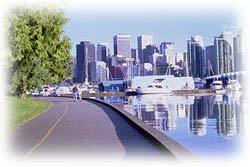 2) Inline Skate from Science World to 2nd Beach, Stanley Park. Meet near front entrance of Science World, Vancouver, BC. Get ready for a social skate from Science World to English Bay or 2nd Beach and back. Free 2 hour parking on Quebec Street and along National Avenue. 3) Inline Skate the Seymour Valley Trail in North Vancouver. Fitness skate with a total distance of 20 km. Full refund if event is canceled. You are responsible for all rental detail. Rental is not included. You need: Helmet (use your biking helmet or rent it), skates, wrist, knee and elbow pads. A waiver must be signed. on hills and in groups of skaters; to stop in traffic; to maneuver curbs; and to avoid obstacles. © 2018 InLineSkateVancouver.com — Improve Balance, Gain Confidence, Get Fit & Have Fun — All rights reserved.